On Saturday morning, more than 1,700 attendees crowded into Zellerbach Hall at UC Berkeley to attend the annual TEDxBerkeley conference, an event created to spark dialogue on topics such as female empowerment, environmental protection, and technological innovation. Designed to mimic the intellectually stimulating atmosphere of TED Talks — the international forum that brings together top innovators, artists, and world leaders to generate world-changing initiatives — TEDxBerkeley is independently organized and allows participants to elevate local ideas to a global platform. The conference was divided into three ninety-minute sessions: “rethink,” “redefine,” and “recreate.” Each session featured an eclectic collection of speakers whose presentations illuminated the latest thinking in their fields of expertise. The second session of TEDxBerkeley, titled “redefine,” began with a visually and aurally stunning performance by Nikki Borodi, a San Francisco-based musician, aerial acrobat, and artist. 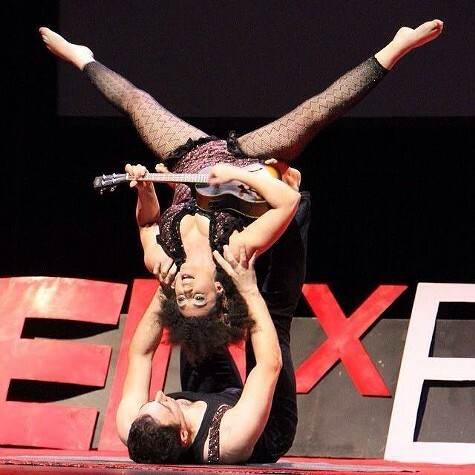 Borodi dreamily strummed a ukulele and crooned hypnotically sweet melodies all while performing acrobatics with her partner, Vangelis Chaniotakis. At times upside down and seemingly weightless, Borodi twisted in and out of a series of beautiful bodily contortions as her flowing musical inflections reverberated throughout the performance hall. Setting the tone for the coming segment, Borodi vividly illustrated the capacity of the human mind to “redefine” reality and tap into deep reserves of boundless imagination. Nikki Borodi performing at last weekend's TEDxBerkeley. TEDxBerkeley concluded with the “recreate” session. Memorable moments included a chilling violin performance by Paul Rucker, a visual artist and composer who uses music to cope with the horrific realities of systematic racism in the United States, and a speech given by Edward Miguel, the faculty director of the Center for Effective Global Action at UC Berkeley, who predicted that climate change will have a particularly devastating impact on African nations.